– The actress playing Glinda wears her shoes for the Shiz scenes while in the opening of the show because she has to change clothes & wig in thirty seconds for the next scene. – The other costumes have also had changes throughout the run, though none as significant as the bubble dress. 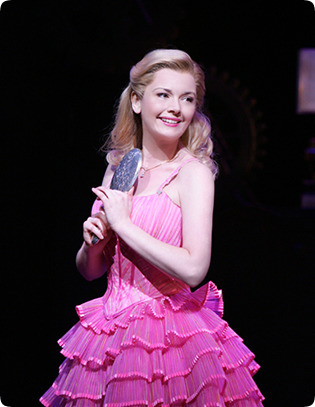 – Glinda actually has two different wands: one for the bubble and one for the catfight. This entry was posted in Exploring Oz and tagged Dianne Pilkington, Heléne Yorke, Jennifer Laura Thompson, Kate Reinders, Kristin Chenoweth, Megan Hilty. Bookmark the permalink. 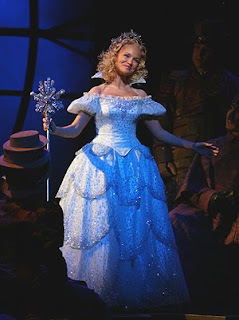 Oh, and the Popular dress had a pretty significant change – it was originally blue in the San Francisco tryouts to tie that costume in which the rest of Glinda's costumes since Glinda's costumes undergo a progression throughout the show, but they changed it to pink before it went to Broadway. And random fact I learnt from the videos they have in the V&A museum in London about the Wicked costumes – Glinda's tiara is actually made of glass. I did not know about the Shiz skirt, and I had forgotten about the blue "Popular" dress. Now as for the glass tiara, that's surpirsing, especially considering it has fallen off of a few actresses and not shattered.